This page contains comprehensive explanations of how to customize your Network Settings — read through it thoroughly and use it as a guide to optimizing your Network! The Settings area in the Network Admin dashboard is where you can configure the important options for your site – like whether people can freely sign up for sites, if you want your network to be private and what emails you want to send out to new users. You configure your network settings as follows: 1. Go to Settings > Network Settings in the network admin dashboard. 2. Once you have made your changes click Save Changes at the bottom of the page. Network Name The Network Name is the name you added when you originally installed your site. This is where you can change your Network Name. The Network Name is automatically added to Welcome Email, Welcome User Email and First Post for newly created users and sites if you keep the variable SITE_NAME in the New Site Settings for the Welcome Email, Welcome User Email and First Post. Network Admin Email The Network Admin email is used for all registration and password reset emails. An address such as [email protected] is recommended. Here’s how you can set up your [email protected] email account in cPanel. Registration is disabled – all usernames and sites must be created by the Super Admin user. User accounts may be registered – usernames can be created using your signup page e.g. example.com/wp-signup.php but sites need to be created by the Super Admin user. 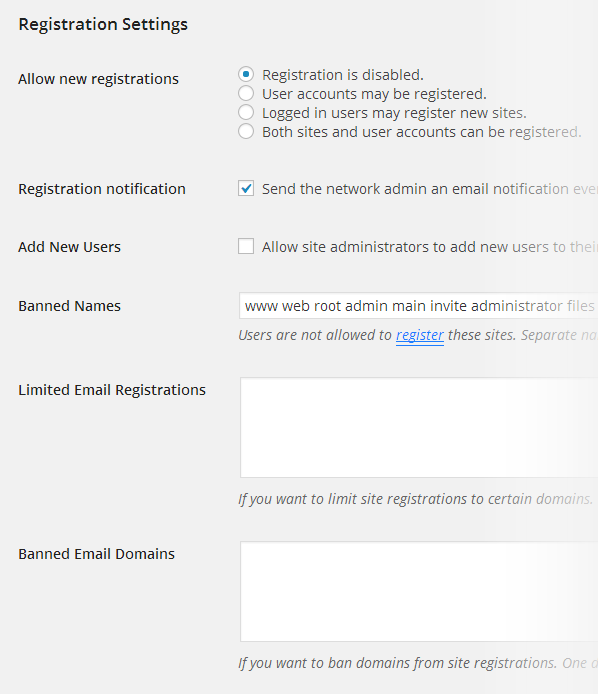 Use Limited Email Registrations to restrict who can signup to specific email domains. Registration notification controls whether the network admin email account receives an email notification every time someone registers a site or user account. By default, this is set to notify of all new registrations. On a large network you would deselect this setting. Add New Users The Add New User option controls whether Administrators of sites can add new users to their site via the “Users > Add New” page. By default, “Allow site administrators to add new users to their site via the “Users->Add New” page” is deselected and administrators can’t add new users to sites. In most circumstances you would allow site owners to add new users. Banned Names You can ban specific names so that no one can register these sites. By default, banned names are www, web, root, admin, main, invite, administrator, files, blog. Examples of names you might add to banned names include ceo, faq, support. Limited Email Registrations Selecting “User accounts may be registered” or “Both sites and user accounts can be registered” means anyone can create usernames and/or sites using your signup page (example.com/wp-signup.php). There are situations where you’ll want to restrict sign ups to specific email domains to limit who registers on your site. You do this by adding domains to the ‘limit email registrations’ field. For example. adding the email domain edutags.net means only those people who have email account with edutags.net can sign up on the network. You enter one email domain per line. Banned Email Domains Spammers can be a nuisance when you allow anyone can create usernames and sites using your signup page (example.com/wp-signup.php). One way of reducing spammers is to ban email domains that are frequently used by spammers. Welcome Email This is the email that your users receive once they have activated their new site. For example, here is what the default welcome email for a new site currently look like. This email can be customized to provide more information about your business while also providing your users with resources to help them use your network. Here is how Edublogs has customized their welcome email: Here is the text that was used to create the Welcome email: Welcome User Email This is the email that your users receive once they have activated their username. Like the Welcome email, this email can be customized to provide more information about your business while also providing your users with resources to help them use your network. First Post This is the “Hello World” post that appears on new sites that are created on your network. For example, here is what the default hello post for a new site currently look like. This welcome post can be customized to provide more information about your business while also providing your users with resources to help them use your network. First Page The first page on a new site. By default the first page for a new site currently look like this. You can customize the first page with whatever information you would like included. First Comment The first comment on a new site. First Comment Author The author of the first comment on a new site. First Comment URL The URL for the first comment on a new site. By default first comment for a new site currently look like this and you can change this whatever information you would like to be included. Site upload space This is the total site storage space that can be used by files stored in the media library. By default the site upload storage space is disabled. If you want users to upload media you need to select the site upload size. Please note the default of 100 MB can be quickly depleted by users if they upload lots of video, audio and image files. Upload File Types By default, file types allowed are jpg, jpeg, png, gif, mp3, mov, avi, wmv, midi, mid and pdf. File Types allowed on Edublogs sites are jpg, jpeg, png, gif, doc, pdf, mp3, ppt, wmv, mp4, xls, ins, isf, te, xbk, notebook, m4a, ist, kmz, kes, mov, flp, avi, swf, wxr, xml, wav, fjsw, docx, pptx, xlsx, xml, m4v, max, kmz, and zip Important: file types must be entered into the “Upload file types” field separated by spaces as shown in the screenshot above. If you enter them separated by commas, errors will result. Max upload file size This is the maximum size of a file that can be uploaded to a site. The default setting is 1500 KB. This is adequate for uploading images but not for video and audio files. A maximum upload file size of 20000 KB is better suited for video and audio files. Enable administration menus The default setting for plugins is ‘disabled’. If you want users to be able to activate plugins you first need to enable access to the plugins menu.